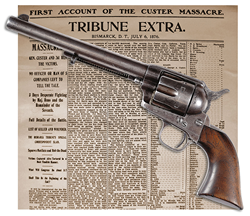 The only documented, complete, and original Colt SA Army positively proven to be used by one of Custer’s men during the infamous Battle of the Little Big Horn realized $460,000. Twice a year, in spring and fall, two separate firearms auction companies conduct a firearms auction back-to-back. This April auction grossed nearly $17,000,000! Each time these combined auctions occur, the results generate the largest gross sales for firearms auction events anywhere in the world. This spectacular event began on April 8, 9 & 10 with a large offering of collectable and shooting firearms presented by the Poulin Auction Company that generated approximately $3 million for their consignors. This was immediately followed by James D. Julia’s Extraordinary Firearms Auction on April 11 and 2-day Sporting & Collector Firearms Auction April 12 & 13, which together grossed nearly $14 million, including multiple world record prices. James D. Julia has handled more firearms from the infamous Battle of Little Bighorn than any other auction house extant. This sale continues to drive that fact. A Colt Single Action Army pistol SN 5773, the only complete and original Colt positively proven to have been used by one of Custer’s men during the infamous Battle of the Little Bighorn. This great American historical treasure, estimated at $175,000-275,000, realized a price of $460,000. 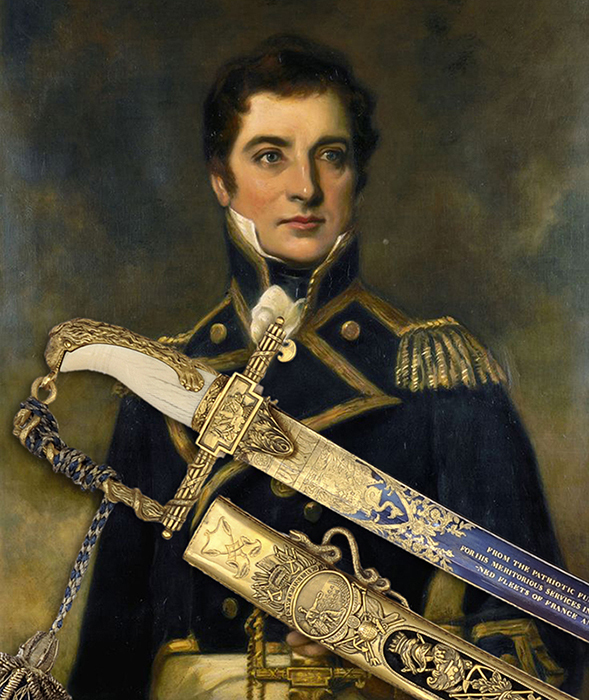 Rare and extraordinary cased 100 Guinea Lloyd’s Patriotic Presentation Sword for a hero of the Battle of Trafalgar, Captain William George Rutherford (1764-1818), Commander of HMS Swiftsure. Three descendants of Captain Rutherford traveled great distances to bear witness to the sale of this important piece of maritime history, including Captain Rutherford’s great-great-great niece who first learned about the sword coming to auction at Julia’s while reading the paper on the subway in her home city of London. She also, in a way, continues the family's proud seafaring tradition as the winner of two Olympic silver medals in rowing. This magnificent sword carried a presale estimate of $150,000-250,000 but saw intense bidding competition and sold over high estimate at $270,250. One of the most exciting Parker shotguns to come to auction in recent years was an incredible, high original condition 20 bore Parker A1 Special. Having fine scroll engraving and gold inlay, this recent discovery carried a presale estimate of $125,000-200,000 and after tremendous competition sold for a whopping $253,000. An absolutely stunning pair of 20 ga. Ivo Fabbri game shotguns set a world auction record for a pair of Fabbris when they sold for $299,000. What really sets these guns apart, other than the meticulous craftsmanship for which Fabbri is renowned, is the remarkable scrolling and engraving. The superbly executed large flowing open scroll with acanthus and floral highlights is a unique creation by Valerio Peli of Creative Arts, whose signature appears on right sides of the trigger plates. This dramatic scroll surrounds engraved portraits of an English Pointer and a Gordon Setter in different poses on each gun. The astonishing engraving work is by Italian master engraver Firmo Fracassi. Often engraving of this caliber takes 1000+ hours to complete, and Fracassi engraves an average of two guns a year for obvious reasons. Simply an irreplaceable pair of guns, and work of this intricacy will most likely not be available in the future. A fantastic and extraordinarily rare early Krieghoff First Model German FG-42 Machine gun SN190. For collectors in the Class 3 world, this is a pièce de résistance. It carried a presale estimate of $175,000-250,000 and despite the fact it is a DEWAT (Deactivated War Trophy) it sold for an extraordinary $195,500. This is the auction world record for a Krieghoff First Model FG-42 and is the world record for any DEWAT machine gun ever sold at auction. This iconic and enigmatic machine gun was used by German paratroopers and had been in a private collection for nearly 50 years before being consigned to Julia’s. As is usually the case for James D. Julia, this auction included numerous important and in some cases, iconic collections. The Warren Buxton Collection is a great example of an old iconic collection. Warren was a wonderful man, passionate collector, great scholar and amassed what is most certainly the finest, most comprehensive collection of Walther arms remaining in private hands today. He was also the author of what is considered to be the three Bibles on Walther pistols. This sale represented the first session (the next will be in late October) for this collection. It included a number of great rarities from Warren’s collection that commanded strong prices, generating over $850,000 in total. His extraordinary Walther Armee (AP) Pistol with long barrel, alloy frame, matching stock, and two matching magazines came to auction with a $60,000-90,000 presale estimate and realized $69,000. Also coming in at $69,000 was an extraordinary Walther MP-PP single action/double action blowback pistol. Walther only made a handful of these large salt blued guns, and according to the previous owner, the pistol was of Chilean origins, possibly for trials to replace the Chilean Steyr Hahn M1912 pistols. Military pistols from the collection of Frank H. Wheaton, III generated strong interest. His superb unissued Singer model 1911A1 presentation semi-automatic pistol attained the highest price from this collection, estimated at $60,000-80,000, it brought just over high estimate at $80,500. His rare experimental High Standard .45 ACP pistol which was the subject of a 1981 American Rifleman Magazine article blew right through its $25,000-35,000 estimate to realize a final price of $48,875. One of the finest collections of German Pickelhauben and early military helmets, and unquestionably one of the best brought to the market in many years, is that of Doug Buhler. An extremely rare Prussian 1st Guard Regiment of Foot Officer’s Model 1897 Helmet which included storage case and Field Marshall shoulder boards from the estate of Prince Heinrich of Prussia, brother of Kaiser Wilhelm II. This excellent ensemble was estimated at $20,000-35,000 and sold for $21,850. A Royal Saxon Guard Rider Officer’s Helmet with silver parade lion which sold for $19,550. Another prize from this collection was an extremely rare Prussian 1st Guard Regiment of Foot Officer’s Model 1897 Helmet which included storage case and Field Marshall shoulder boards from the estate of Prince Heinrich of Prussia, brother of Kaiser Wilhelm II. This excellent ensemble estimated at $20,000-35,000, sold for $21,850. Another fine collection is that of German industrialist, Friedrich-Wilhelm Dauphin. This was the final session of Mr. Dauphin’s Collection of Rare Military Pistols and the highlight was an absolutely superb Early Loewe Borchardt Model 1893, SN 13, with experimental features in absolutely stunning condition; it was estimated at $50,000-$100,000 and realized a final sale price of $74,750. The Prussian Guard du Corps helmet was estimated at $8,000-10,500 and went way over high estimate to $14,950. Another great collection was the world renowned collection of British rifle collector Robert W. Faris and included his incredibly rare 1924 British R.S.A.F. Enfield .303 SMLE No.1, MK VI Prototype Rifle, which blew away its estimate of $15,000-25,000 and sold for $56,350. Also from the Faris Collection were the only known surviving specimens of the British R.S.A.F Enfield .303 SMLE 1902 rifles made in 1901 for the ensuing troop trials of 1902, one being the A pattern and the other being the B pattern. Each was estimated at $15,000-20,000, and each sold for $31,625. The Dr. Zack Catterton Collection of Rare Confederate Arms included a Dance SN 243 which sold above low estimate at $46,000. His Griswold Navy, SN 1218, estimated at $25,000-30,000, topped out at $28,750. This sale also included the final session of the Allen Hallock Collection of Extraordinary Schuetzen Rifles. Mr. Hallock’s collection is probably one of the finest of its type today. The highlight of his collection was an extraordinary solid silver, gold and enameled trophy referred to as the Ehret-Schuster Trophy which was presented at the first National Bundesfest held in America in 1895. It carried a presale estimate of $40,000-60,000 and went out at $43,125. His Hoffacker Martini Schuetzen was estimated at $8,000-12,000 and went out at $21,850, while his CE Haenel Schuetzen was estimated at $8,000-12,000 and sold for $20,700. The Donald H. Dix Jr. Estate Collection (much of which was sold previously by Julia’s) included his Saco-Lowell M60 which carried a presale estimate of $28,000-38,000 and went out at $46,000. His Fleming Steyr was estimated at $10,000-15,000 and it went out at a strong $33,350. In addition to important private collections, the Julia sale consisted of a vast array of quality items from many different niches of the firearms collecting world. Quality Colts are a standard at Julia’s and in addition to the Custer Colt was an exquisite engraved gold and silver Tiffany grip cased Model 1849, which was estimated at $15,000-25,000. It had formerly been in such prestigious collections as that of Al Kelley and Robert Sutherland. This gun went out just over $25,000. Julia’s is the leader in the world today for high-end, rare and valuable Confederate and Civil War items. In the last few years, they have handled a number of important collections of Confederate and Civil War arms. In addition to the Dr. Catterton Collection in this auction, there were numerous other fine Confederate items including a rare octagon barrel Dance Dragoon carried by Corp. John Hargrave from a Texas unit. The gun was consigned directly from a descendent of the Hargrave family and went out at $57,500. A Colt 1851 Navy which had been presented by the infamous Confederate raider, John S. Mosby, came to auction with a $15,000-25,000 estimate but flew far beyond the high estimate to $40,250. A rare North Carolina 10-Star First National Confederate Flag was estimated at $20,000-30,000 but topped out way above high estimate at $48,875. Julia’s regularly handles high-end historical items at their sales, and included in this sale was the finest collection of Charleston South Carolina Slave Tags that they have ever offered. 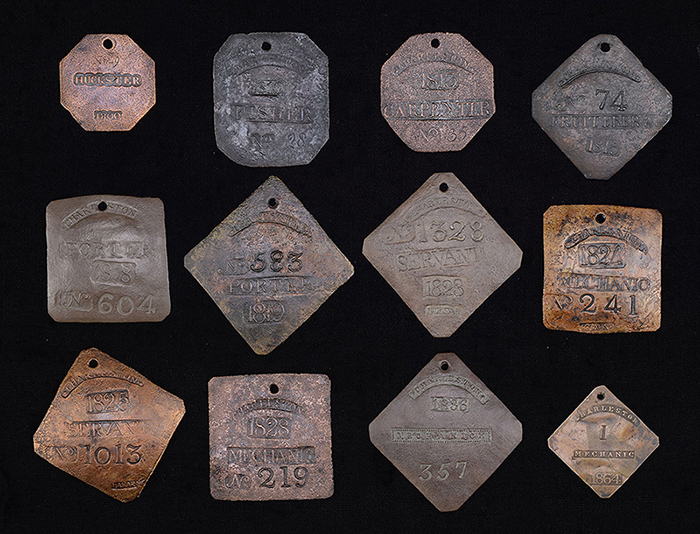 This group of 12 Slave Tags topped out at just over $86,000. A select grouping from a noted scholar included a number of early weapons, including Wheelocks. The most unique lot was a massive rare pair of Dutch Wheelock Hand Mortars which dated around 1625. Estimated at $35,000-55,000, they sold for above high estimate at $57,500. For many years now, the Julia firm has had a reputation of selling more high-end, rare and valuable Sporting Arms than any other auction house in the world. 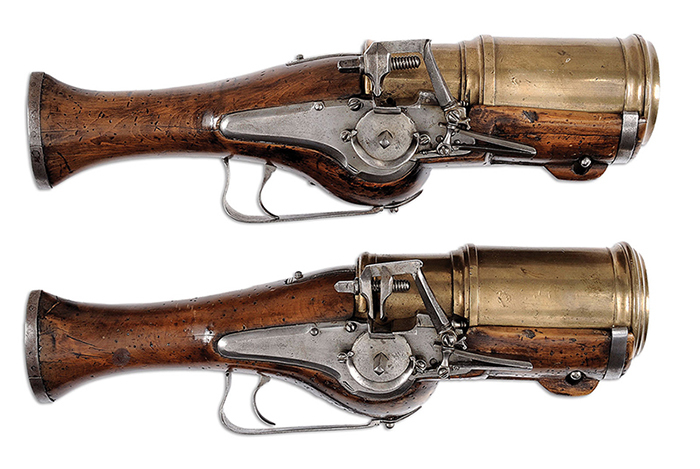 In addition to the pair of Fabbris mentioned earlier that brought approximately $300,000, an exquisite 28 ga. Pinless Sidelock Ejector O/U gun estimated at $95,000-120,000 went out at $103,500. A superb 20 ga. James Purdey with extra barrels carried an estimate of $25,000-35,000 and went out at $46,000. A number of quality American Sporting Arms included a rare Winchester custom grade Model 21 410 with gold inlays estimated at $40,000-60,000. It sold for $46,000. A very fine H&H Double Rifle cal. 500/465 Nitro “India Royal” Model estimated at $47,500-67,500 went out at $55,200. Winchesters and Volcanics included an extraordinary New Haven Arms cased pistol #1 with very rare 6” barrel. It was in great condition and carried a presale estimate of $30,000-50,000 and went out at $37,375. A high relief gold plated Winchester Model 66 signed by Conrad Ulrich was in outstanding condition but at one time had been mounted with an appropriate replacement stock. It went out at $12,500. 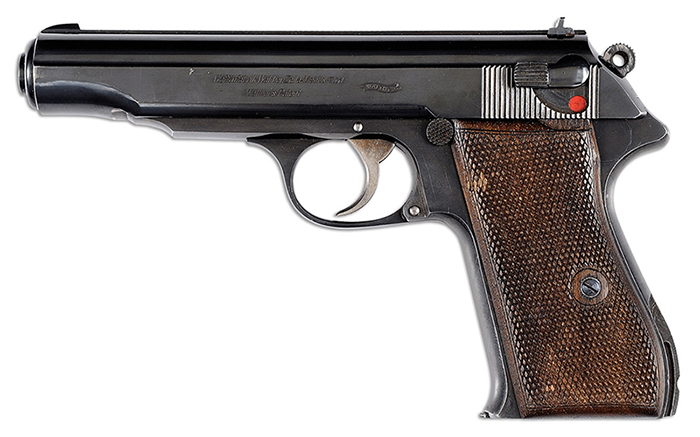 A rare small bore nickel plated Model 73 Deluxe carried a presale estimate of $30,000-50,000 but flew far past the high estimate to finally sell at $74,750. A stunning L.C. Smith monogrammed Grade 20 ga. estimated $20,000-32,500 went out at $20,700. One unusual and interesting lot in the sale was a superb handcrafted Werner Concord Style Stage Coach. In superb condition and entirely handcrafted, it was at one time in the collection of the late and renowned Winchester collector, Wes Adams. The coach had not only been a prideful part of his extraordinary collection, but bore him to the graveyard after his demise. It carried a presale estimate of $30,000-40,000 and went out at $46,000. A silver mounted Bowland Saddle was estimated at $30,000-50,000 and sold for $39,000. Just after the auction concluded, Josh Loewensteiner, an agent for Julia’s, proudly announced that he had just completed a contract to handle the Estate of the late Dana Tauber which includes what is believed to be the finest grouping of A.H. Fox Shotguns ever assembled. This collection will be in their late October 2017 sale. For a number of years now, Julia’s has consistently handled some extraordinary and important military collections and this sale included various collections as previously mentioned, but one special item consigned by a private collector was an extremely rare pre-WWII Polish Wz .38m Semi Auto rifle estimated at $40,000-80,000, which sold for $69,000. The rifle was developed by Josef Maroszek and adopted by the Polish Army as the Wz. 38 M. A very limited production of just 55 of these rifles was completed in 1938 by Warsaw Rifle Factory 2 (Zbr.2) before the German invasion. 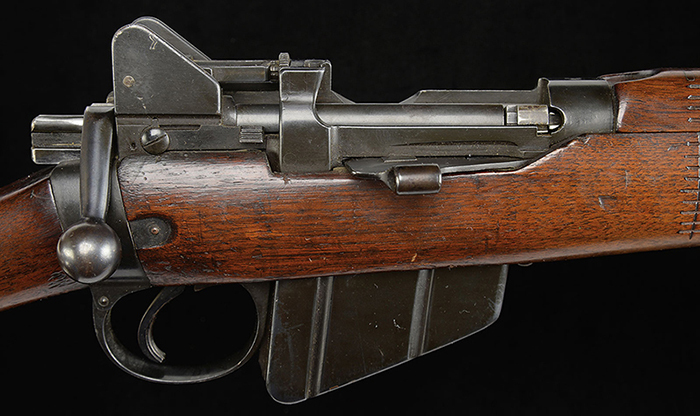 Just five known documented examples are known to have survived, and this rifle, with an overall appearance and finish that is near mint, is one of only two of these that have been in the United States. This rare rifle generated intense interest and bidding. An Officer from the Polish Army came all the way from Warsaw to Maine to repatriate this rifle to his homeland. After much bidding, this extremely rare and historical rifle is indeed heading back to its origin and will eventually be preserved and displayed at the Polish Army Museum in the heart of Warsaw. When talking about Military items, there is one thing for certain and that is Julia’s excels in the Class 3 department. Since 2008, John Keene, head of the Class 3 Department, has kept a detailed analysis of Julia’s Class 3 sales as compared to all other North American Auction Houses and Julia’s has consistently, to this day, on average sold more Class 3 than all their North American competitors combined, both in the number of units and in dollar value. This sale generated extremely strong results. In addition to the Krieghoff previously mentioned, an 1898 Brass Argentine Maxim estimated at $30,000-40,000 went out at $43,000. A very scarce Krieghoff FG-42 Second Model generated approximately $150,000. An iconic German MG-42 Tripod Machine Gun estimated at $32,000-42,000, brought $57,500 which is now a world auction record for that model gun at auction. Another highlight was the Colt M-16 A1 with grenade launcher used in the 1983 movie, Scarface, in which Al Pacino announces, “Say hello to my little friend!” It carried a presale estimate of $25,000-50,000 and went out at $51,750. A desirable Steyr AUG Machine Gun with Fleming auto-sear pack was estimated at $10,000-15,000 but shot to $33,350; another world auction record for this type of gun. A registered full auto H&K Machine Gun estimated at $15,000-22,000 brought a new world auction record which was slightly over $43,000. Sessions 2 & 3 featured Julia’s newly formed Sporting & Collector sessions. This session usually includes guns that average under $8,000-10,000 with some exceptions. A vast array of firearms were offered over these two days, including fine moderately priced shotguns, Winchesters, Colts, etc. A Winchester Model 66 Carbine estimated at $10,000-17,000 went out at $13,800. A Colt from the Collection of Gary Helin estimated at $7,500-10,000 went out at $12,075. This session of the sale included a little over 1,000 lots and saw a great deal of participation. Julia’s next Firearms Auction is scheduled for Fall of 2017 and will again include a fabulous collection of spectacular arms. James D. Julia, Inc. is one of the top 10 antique auction houses in North America as measured by annual sales. It is headquartered in Fairfield, Maine. The company also has an office just outside Boston, Massachusetts in Woburn and has been in business for nearly 50 years. The company conducts high-end, antique collectables and fine art auctions throughout the year. Julia’s has routinely established new world auction records through its sales events. The company consists of 3 key divisions. The rare Firearms Division in which they are the leader today for high end, rare and valuable guns. Their next Fine Art, Asian & Antiques Division auction will take place in August 2017. Also, the Rare Lamp, Glass & Fine Jewelry Division, again a leader in this genre, will hold their next auction in June 2017. Each division is regarded for its excellence and is staffed with world class specialists to ensure fair and professional authentication, identification and evaluation services. For more information on James D. Julia, Inc. please visit http://www.jamesdjulia.com. A true pair of Ivo Fabbri 20 ga. O/U with detailed engraving by Italian master engraver Firmo Fracassi realized $299,000, the highest price ever realized for a true pair of Fabbri shotguns at auction. Rare and superb cased 100 Guinea Lloyd’s Patriotic Presentation Sword for a hero of the Battle of Trafalgar, Capt. William G. Rutherford, realized $270,250. An incredible high original condition 20 Bore A1 Special Parker with gold inlay realized $253,000. An early Krieghoff First Model German FG-42 (A DEWAT model) sold for $195,500. This is a world auction record for a Krieghoff First Model and it is also the most expensive DEWAT ever sold at auction. An extremely scarce Krieghoff FG-42 Second Model realized $149,500. Perhaps the finest collection depicting the rarest varieties of Charleston, SC slave tags to come at auction realized $86,250. This rare, massive, and most recently discovered Henry Schively Bowie knife realized $80,500. A superb unissued Singer Model 1911A1 presentation pistol from the noted Frank H. Wheaton III Collection realized $80,500. Superb early Borchardt pistol with experimental features from the collection of noted German Industrialist, Friedrich-Wilhelm Dauphin, realized $74,750. A phenomenal Walther MP/PP Blowback prototype pistol with shoulder stock lug realized $69,000. An extremely rare Polish Wz-38M semi-auto rifle realized $69,000. It was purchased in person at the auction by a military attaché from the Polish Army Museum. A very rare Confederate Dance Dragoon with octagonal barrel carried by Corp. John Hargrave in a Texas cavalry unit realized $57,500. A c.1625 pair of massive, very rare Dutch Wheelocks from a renowned scholar's collection realized $57,500. 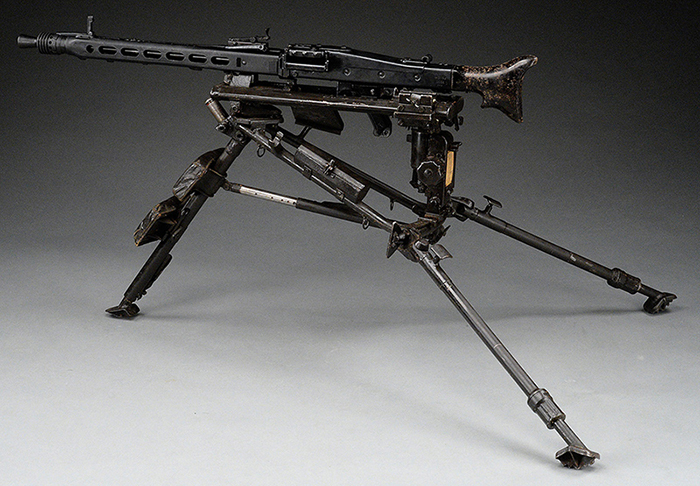 A rare and iconic German MG-42 machine gun on a tripod realized $57,500. From the world renowned collection of the late Robert W. Faris came this incredibly rare 1924 British R.S.A.M. Enfield 303 SMLE No. 1 MKV1 prototype rifle which realized $56,350.